If you see a “Hacked By MuhmadEmad” message on your WordPress blog or website, you are not alone. Below is the way to fix this message. How it happened, why it happened, and how to fix this error can be found on my recent article: How To Fix and Secure WordPress Websites Hacked February 2017. 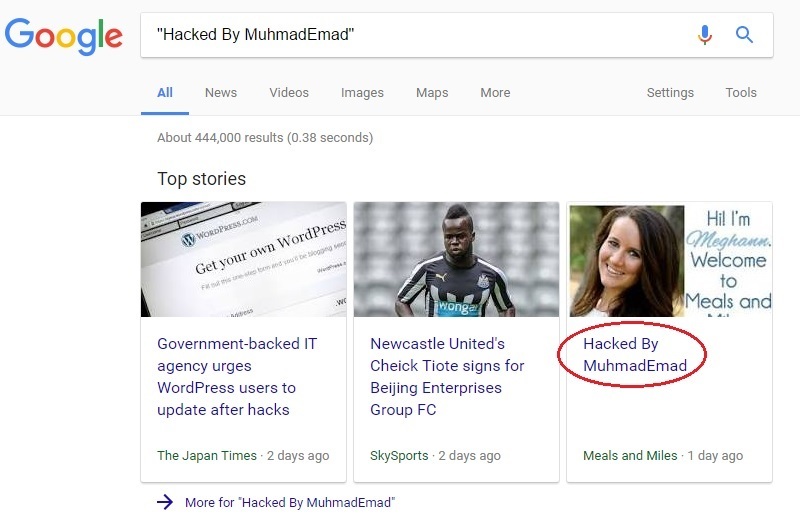 As of February 2017 a Google search of “Hacked By MuhmadEmad” now displays 678,000 results. Rest assured, that number is closer to 1 million as Google likely has yet to crawl and index all of the content. This number was 444,000 as of February 9, 2017, just 8 short days since the attacks begun on February 1, 2017. The attack hits small business blogs, law firm websites, pet blogs, mommy blogs, coupon websites and ever law enforcement websites, colleges and educational sites and websites which have access to “Google News”. Hacked Content displaying “in the news” on Google News approved websites. .EDU sites which have been hacked. Are you getting the “MuhmadEmad” posts on your website? If so, please read How To Fix and Secure WordPress Websites Hacked February 2017 and follow up in the comment section below.